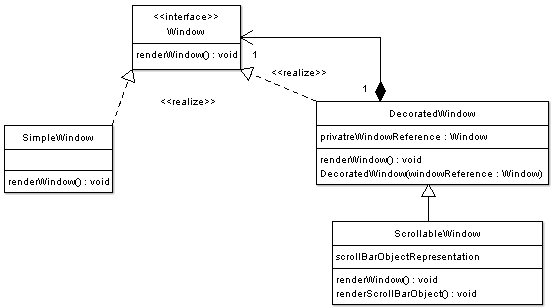 Decorator Design Pattern is applied in Graphical User Interface toolkits to add dynamically windows behaviors. As discussed previously a persistence API can have many implementations depending on the presence or absence of a relational database, a file system, as well as on the underlying operating system. The code below illustrates the Window interface representing the component interface. The code below illustrates the basic decorated window implementation. Note that the decorator maintains a reference to a window object that is being decorated. The code below illustrates a driver program for the window component. Note how the scrolling functionality has been added dynamically at runtime.